Jimmy Carpenter hit the road in 1980 with renegade blues band The Alka-Phonics, from his hometown of Greensboro, NC. After 8 rather blurry years he relocated to Charlottesville, VA to join Charlie Pastorfield and The Believers, an original bluesy pop band. From ’88-’95 The Believers toured the Mid-Atlantic extensively, and self-released 3 recordings of original material, “Golden Road” 1989, “I’m Your Prisoner” 1991, and “Live at Red Hot & Blue”, 1993. For most of his time with The Believers Jimmy did all the booking, publicity, bookkeeping, payroll etc, and learned a great deal about the business. 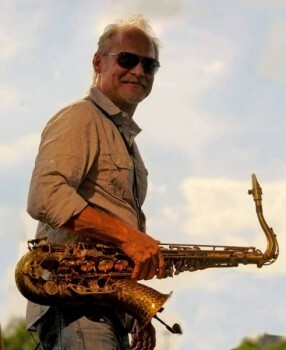 He then spent 2 years as an agent and promoter in the DC area, and took the first opportunity out, which came as a phone call from blues guitarist Tinsley Ellis, with whom he toured in 1998, doing about 250 shows nationwide. In 1999 he joined old friend and stellar guitarist Jimmy Thackery, and worked with Jimmy as saxophonist and road manager until the end of 2004. Carpenter recorded 4 cd’s with Thackery, Sinner Street (Blind Pig), We Got It, True Stories and Whiskey Store Live, all on Telarc. In the meantime having moved to New Orleans, Carpenter was determined to break into the scene in the Crescent City. He left Jimmy Thackery in December ’04 to pursue opportunities here in New Orleans, and thus began what has been a wild adventure, musically and otherwise. He is also a member of The Sophisticatswith a brand new CD out called “When it Rains, it Purrs”. This entry was posted in Past Productions, Roster.